Police are investigating after a man punched an elderly man apparently at random inside a Frankford store last week. Surveillance image of suspect released by the Philadelphia Police Department. 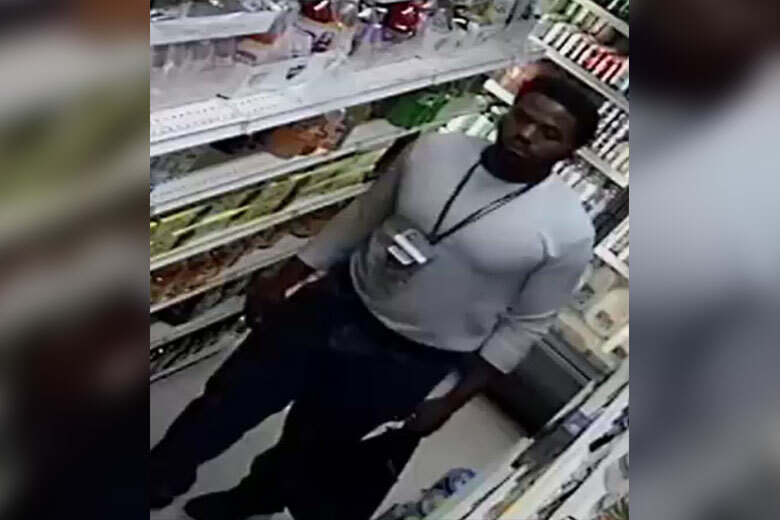 Police are looking for a man who, seemingly at random, attacked a 70-year-old man last week inside a Frankford grocery store. The older man was inside DJ Deli, 4324 Wingohocking St. (near Unity Street), just before 6 p.m. on Wednesday, April 10, when the suspect punched him in the head numerous times and knocked him down, authorities said. Surveillance footage shows the older man sprawled out in the corner as the suspect leaves the store. The man, who was at the store buying milk, was taken to Einstein Medical Center and had to receive stitches for cuts to his head, police said. He told authorities he did not know the man who assaulted him and had no interaction with him inside the store. Police described the suspect as a black man around 30 years old with a black beard. He was wearing a white long sleeve thermal shirt and blue pants at the time of the attack.